Why does Fritz use a mixer? 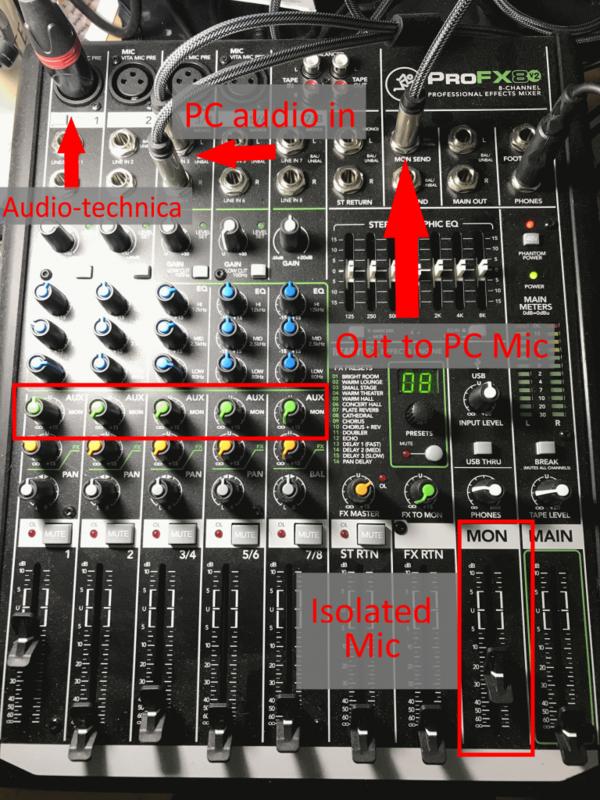 A mixer allows me to use XLR connections for microphones on my PC. This leads to typically higher quality microphones with a condenser. I can tune the levels from my microphone on a separate device, adding bass and bending the sound wave to make my voice sound better. I can mix the other sounds on my PC and my voice appropriately so that audio content is easily routed to various applications. This can be done with an application, but that takes up screen space while I’m producing a show and I don’t want to juggle windows, show you my mixer during a show, or accidentally change a setting. I can bring in sounds from other devices easily with additional cabling, as the mixer is connected with a single USB into my PC. With my headphones plugged in to the mixer, I can hear the exact audio mix that is being broadcast to the stream or recording. What limitations and problems does the mixer create? I have different audio configurations for communications apps like Skype, Teams, and Zoom. This gets a little confusing to juggle. Mixing audio is a science that takes time to learn. I know just enough to be dangerous, and I’m only mixing two or three audio sources. There is now a large audio-cabling spider that is claiming part of my desk. The OCD in me wants to put it on its own desk next to my PC, but I need access to it. There are smaller mixers available, but I want to be able to expand in the future. 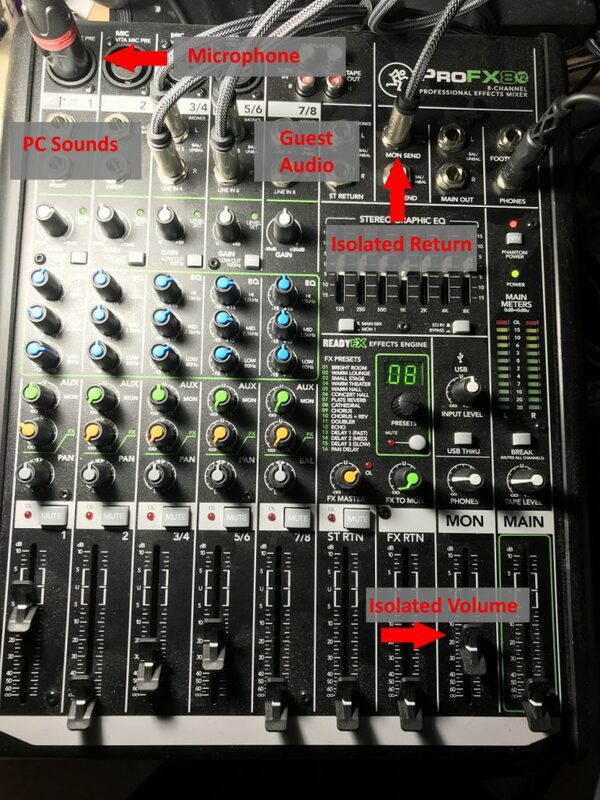 Any effects that I want to add to my microphone on the PC need to be re-routed back into the mixer for me to hear it. This re-routing adds a SLIGHT delay and will drive you crazy. The main output audio from this mixer is delivered over BOTH USB and the “Main Out” connectors on the top-right corner of this photo. I don’t use the connectors nor the volume slider in the bottom right because I use the USB connection to my PC. The main output mix is controlled by the vertical volume sliders and mute buttons across the bottom of the mixer. My microphone is in channel 1, the entire left-most column of the mixer. The XLR cable is plugged into the top, and you can see I have the blue equalizer dials for that channel dialed to give my voice a little extra bass. Channel 3 has two cables plugged into the top. These are unbalanced 1/4″ cables with the stereo audio from the headphone jack on my PC. The slider at the bottom reveals that I currently am only mixing a low volume of PC sound into my main output. The next highlight on the bottom right says “Isolated Mic”. I am using the “Monitor Send” of this mixer to send a mix to the 1/8″ microphone connector on my PC. This is a mix that would be appropriate for communications applications. Calling someone with Skype? Joining a Teams or Zoom conference call? You’ll ONLY hear this mix, with the overall mix volume set with that slider in the bottom left corner. The CONTENTS of the monitor mix are set with the green knobs on each channel that are labeled “Aux” and I’ve drawn a box around. I do NOT use this mix when I produce my stream, instead I take the main feed from the mixer. I have two sources of Audio Input capture in OBS: Wireless Mic, and Mixer. The “wireless mic” is a simple wireless microphone that I recently acquired so that I can present at a live event AND stream without being tethered to the PC. The “Mixer” feed is the USB input from the Mackie board. The overall volume of the mixer’s output is set with the horizontal slider underneath a volume meter that I don’t want to reach into the red area. When volume gets into the red, it clips, it stutters, and sounds bad to our ears. I’ve been running into a reverb problem with guests and folks on Teams, Skype or Zoom. Since ALL of my PC speaker audio comes into channel 3 of my mixer, I can’t send things like sound effects or other system sounds to my guests over these applications. I want them to get the laugh when I drop in that “and then” sound bite! If I turn add channel 3 to the monitor, they will hear themselves, and if I turn on “share system sounds” in Skype, they will again hear themselves. I need to isolate all of the PC sound EXCEPT their audio. I realized something amazing this weekend while preparing for my co-stream with Quiltoni. HDMI cables carry audio signal across them, and if you have a connected display with speakers or BETTER YET, if your display has an audio connector for you to add speakers, you can send audio JUST to that display. This was the opening that I needed! 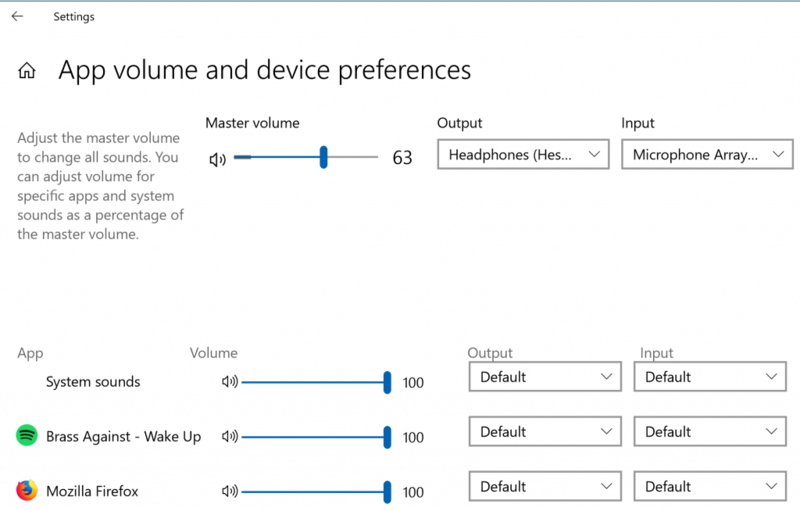 Using the standard Windows 10 application sound settings, I could route JUST the sound from these communications applications over the HDMI connection to my display. From my display, my new cable would bring their dedicated sound into CHANNEL 5/6! You can see from the photo that the fourth column and connector, labeled 5/6, is now in the main mix but NOT included in the isolated return as the volume on the green aux dial is turned off. The audio from all of my other system sounds to the aux, the green dial, is now turned up in channel 3. I can now send those sound effects or game sounds or whatever I want to share with my guests! Yes, what I am doing here could be accomplished with a software-based mixer. I think a hardware mixer is a better long-term solution for me, as I continue to expand my broadcast capabilities. With the addition of one patch cable, I have expanded my audio interaction capabilities with guests and my colleagues when I am talking to them with my microphone. Have I missed anything? Do you have any questions about this setup, or building your own audio setup? Let me know in the comments below.